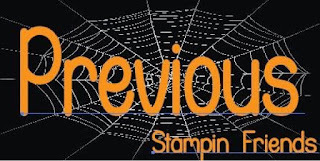 Hi Everybody and welcome to the October Stampin' Friends Blog Hop! This month our theme is Halloween. You may have already been hopping along with us in which case you have arrived here from the extra talented Kirsteen Gill's blog! If this is your first stop then welcome to it! This month we have 13 talented paper crafters who each made a card and a project to inspire creativity in others. I hope you'll hop along with us and enjoy the talent and creativity that this group has to offer. This month we have two amazing guest hoppers that we hope you will check out... SURPRISE! I'm one of them-wink! Please make sure you also check out Cindy for some awesome projects! Here's my Halloween themed card... I used a doily, some ribbon, paper, burlap ribbon and linen thread to make something of a wreath on the front of my card. I did a lot of sponging and even sponged the linen thread. Here you can see that there might be a little more to this card than meets the eye... Mwuahaha! Yup! It's a 3D box card! 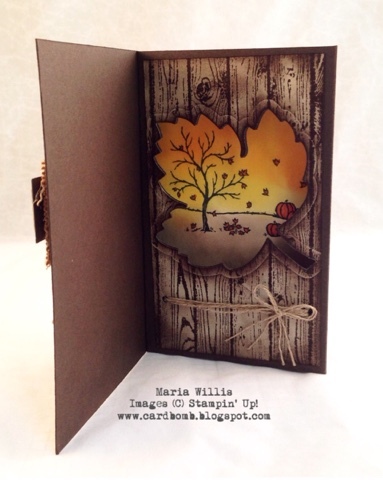 I saw a beautifully decorated leaf card on Dawn Griffith's website and knew I wanted to do something like hers for the inside of my card. So I designed a completely different card front and based my inside design off of hers (but with some changes). Here you can see the 3D factor in action. 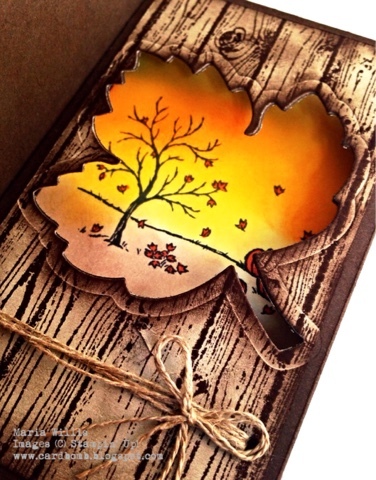 I love cards with dimension and this type of box card is my new favorite as it is so easy to put together. And, just in case you would like to make your own, here is a how-to video on these 3D box cards. Enjoy! For my project I made a series of treat bags using Stampin' Ups! Howl-o-Ween Treat and some Halloween DSP that I dug up out of my stash. I cut strips of DSP to 12" x 4" and scored at 2" and 4". I creased the DSP and nestled it into the bottom of the bag so that it would have a strong base and give some shape to the bag. With a two inch strip of DSP showing in the front, and the pattern from the opposite side showing in the back, you get a pretty fun look! I cut strips of basic black in 4" x 4" lengths, scored them in the middle, and decorated them to finish off these cute treat bags. Inside is a pretty good stash of caramel apple taffy-YUM! I hope you've enjoyed my projects today and that you will keep hopping along with us to see all of the amazing projects the rest of my Stampin Friends have made to share with us. Next up on our hop is the fabulous Elizabeth Thatcher! WAIT! I'm not done yet! Want a chance to win a $25 gift card? Here's what you've got to do. Follow this hop all the way through until you get back to the wherever you started and make sure to leave a comment on everyone's blog. At the end of each of our posts we will tell you what our current favorite stamp set is. Write down every hopper's name and favorite stamp set and mail your list to Elizabeth Thatcher at happystamper508@gmail.com before midnight on Sunday, October 18th, 2015. 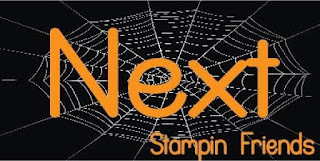 You will be entered in a raffle to win a $25 Stampin' Up! gift card. My current favorite stamp set is Lighthearted Leaves. LOVE your card Maria, It is stunning! Wow, these are great! Love the card and the surprise inside! The card is SO beautiful and I loved the tutorial as well. Thanks so much! Glad you liked the tutorial! Maria, first off, congrats on the guest spot, I love your work, so fun to see you here. Also, I cannot wait to make that box card, soon!! Your card and gift bags are perfect! 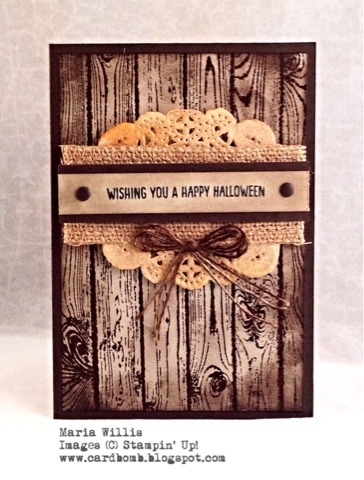 I like that your Halloween card is non traditional, it's unique! Thanks AJ! It's always a good month when I get to join this hop! WOW! Your card is absolutely amazing! 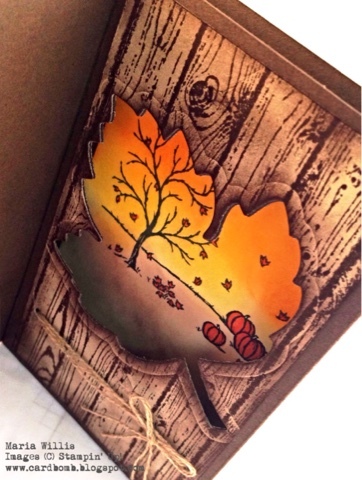 Thanks for sharing how to make the box card - yours is beautiful! The treat bags are a great idea, and very cute! Thank you Deborah! I really appreciate it. Oh my goodness! What a great card! Love the treat holders too! 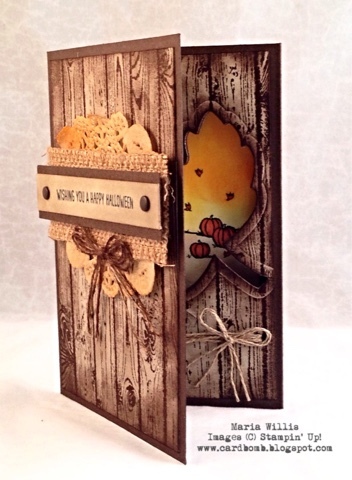 Another stunning card with adorable treat holders! Amazing job! That leaf on the inside that card is beautiful ! I really want one of those treat bags. Your card is absolutely fabulous! There are so many possibilities for it! I LOVE IT!!! The treat bags are adorable too ~ I can see using them for any and all occasions. It is just a matter of changing up the DSP and candy. Thanks for the ideas. They look wonderful. You did an exceptionally good job on them. Love your card! Thanks for the video tutorial! Love your card, and the treat holders. That card makes me want the Happy Scenes set, absolutely adorable!! I am in love with this card and treat bag. I would love to case it for Thanksgiving for my brothers dinner at his home. And i'm going to try to do the treat bags in a Thanksgiving theme also for the table favors. I LOVE this project and you did a great job and thanks for the video. Beautiful projects! !....Those are really cute treat bags!!! Ok now I just love love your card! I also love your cute treat bags!